Did Billy Crawford leave It\'s Showtime? Kim Atienza posted these photos of Twitter and wrote in the caption: "iiiiiiiiiiit's showtime! You will always be family! @BillyCrawford @coleengarcia @ERUPTION"
Did Billy Crawford leave It's Showtime? "iiiiiiiiiiit's showtime! You will always be family! 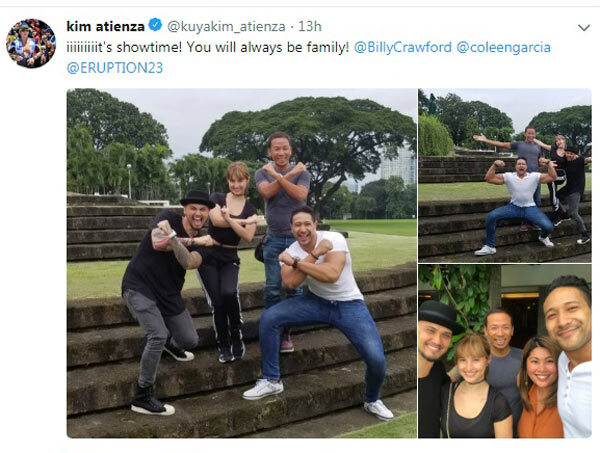 @BillyCrawford @coleengarcia @ERUPTION"
This was accompanied by photos of Billy with Coleen Garcia as well as Eric Tai with wife Rona Samson. PEP.ph (Philippine Entertainment Portal) recently dubbed Billy Crawford as the second most-visible Kapamilya artist because he is seen in several TV shows. Vice Ganda earned the No. 1 spot. Aside from hosting It's Showtime, Billy was also seen in Pilipinas Got Talent and the recently concluded Your Face Sounds Familiar Kids. It has been four months since Billy wed Coleen Garcia last April 20.